What Is I Ching Hexagram 37 All About? Hexagram 37 gives the wisdom of the importance of communication when dealing with the family unit and other team-based groups. Clear communication with mutual respect and kindness is the only effective form of speaking. There are many types of groups, each with their form of communication that works best in that atmosphere. It doesn’t matter what the type of group is. When speaking with others, there should be respect or real meaning. If that is missing, then progress cannot continue until you solve the conflict. It is important that each member of the team understands their role in the group. Then you can encourage them to feel good in their role. Hexagram 37 shows the significance of having a strong form of open communication within a group. Take the time to help those who might be lost or confused on their path within the group to maintain consistency. Doing so will show the individual and the group that the leader or other team member is sincere in their work within the group. Being willing to provide service for others in a group shows a person’s true character. I Ching 37 says that effective communication is necessary for a good relationship with the people around you. Do not hesitate to ask questions nor look down on people asking them. 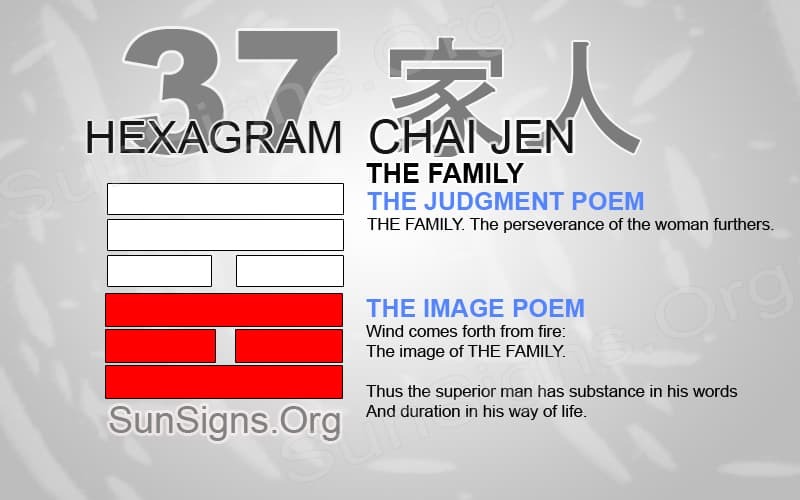 Hexagram 37 speaks directly to the family unit as the most important group to be a part of. Clear and consistent communication is important within the family to make sure everyone understands the same issues and progression. When parents speak directly and openly to children, then the next generation can learn how to communicate effectively. If we keep secrets from each other in a family, then it becomes difficult to listen to any form of communication in fear that the information will be false. Parents should make an effort to understand what is going on in their child’s life. But they should also respect their children’s individuality. Clear communication within the family will affect how the children will then communicate with others in the community. When communicating in a work-related team, certain forms of communication usually work best. When giving instructions in a daily morning meeting, make sure that the points given are clear. There should not be any scope for misinterpretation. Each member of the team needs to understand what is going on to further the progress of the business. Make time to answer any questions and make sure that none of the questions asked sound meaningless. Each has their way of processing information. And, sometimes a stupid question to one person is an honest question to the person asking. We must have mutual respect for every member of the team. For a team to function properly, each member needs to be able to understand their role within the group. Clear communication and instruction will make this possible. But sometimes the one-on-one discussion is necessary when trying to explain a role to a new team member. THE FAMILY. The perseverance of the woman furthers. The image of THE FAMILY. And duration in his way of life. I Ching 37 yijing says that no matter the group setting, clear communication is necessary to further the progression of the unit. Make sure the form of communication is appropriate for the setting. But it should also be clear enough, so there is no room for misunderstanding. Parents are responsible for the type of communication skills their children have. This depends on the type of communication within the home. A child has to understand the importance of clear, respectful, and sincere communication. Only then, they will be able to survive in any other type of group setting.